How does an alarm clock iOS application mature and develop into a tool with a unique-some would say "ahead of it's time"-value proposition? Simple. It becomes a sophisticated hub of integration within the Internet of Things ecosystem. This is the story of Cleu 3.0. Having evolved through two versions, Cleu was looked at as an aesthetically pleasing application that elevated the alarm clock vertical. But times had changed and the space had become inundated with time-keeping competition. Concurrently, the Cleu user base was becoming more sophisticated and began dabbling in IoT devices within their homes. 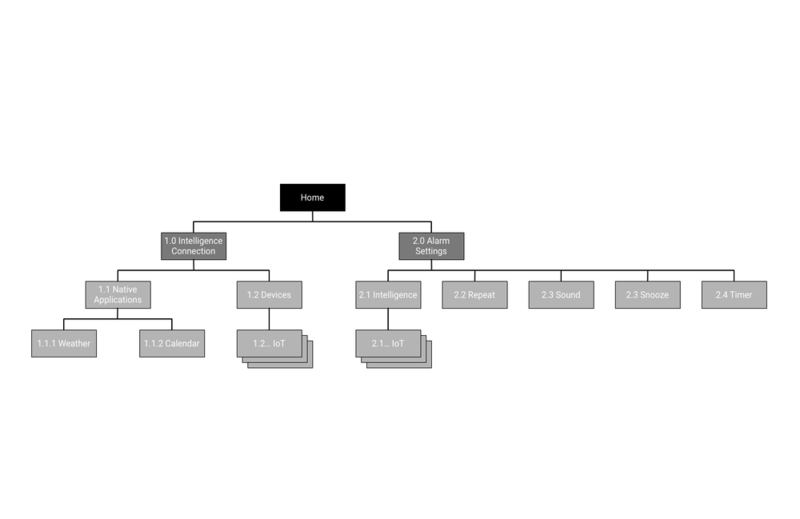 After studying this development, it became clear that there was a need for a consolidated solution to device organization, as well as a unique alarm that utilized these connected devices. I came onboard to help the Cleu team bring an already well-received iOS application into a new realm of functionality by positioning it as a hub for the connected home. Cleu had already pioneered a gestural based alarm activation mechanism that helped define it's uniqueness. But despite that progressive design feature, it lacked the architectural capabilities to seamlessly scale into the connected environment. In addition to the IoT pain points that were becoming evident, the redesign timing happened to coincide with the market introduction of the Apple Watch. Having noticed the habits of those around us, using their phones for both timed productivity sessions as well as naps, the Cleu team decided the time was right to introduce a watch extension of the Cleu iOS application. Is there a market desire for an Internet of Things enabled controller, posing as an alarm clock? Is it possible to build connection functionality in a seamless fashion that allow for ease-of-use as well as future scalability? Could it all be done within a 2 month deadline? Because Cleu was bringing in legacy alarm clock functionality from the previous two versions, I was focused on the extension of the product as a connected device. I chose to approach this challenge by pursuing a user centered design methodology covering the stages of Discovery, Concepting, and Prototyping & Testing. Cleu had already amassed 70K downloads by the time work on 3.0 had started. So the first move was an easy one...find out what the users thought. As I interviewed current users, I kept in mind a few proto-personas the team had been discussing. Two personas didn't prove as relevant (currently), but the third was a spot-on match. 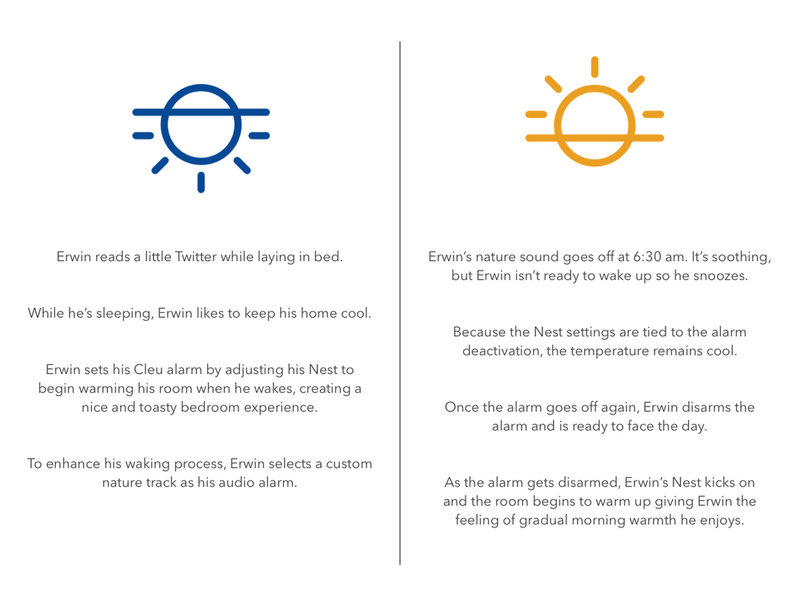 Meet Early Adopter Erwin. Every week a new alarm clock was hitting the app store. We tested each one for functionality, creativity and connected ingenuity. Eventually the best rose to the top. As clocks we had our sites set on Sleep Cycle & Rise; for in-house connected controllers it was Nest & Hue; and there was no holding back the ingenuity of the team at IFTTT with their IF & DO Button. The average Cleu user was using the application at least twice a day...right before falling asleep (set the alarm) and first thing in the morning (turn the alarm off). 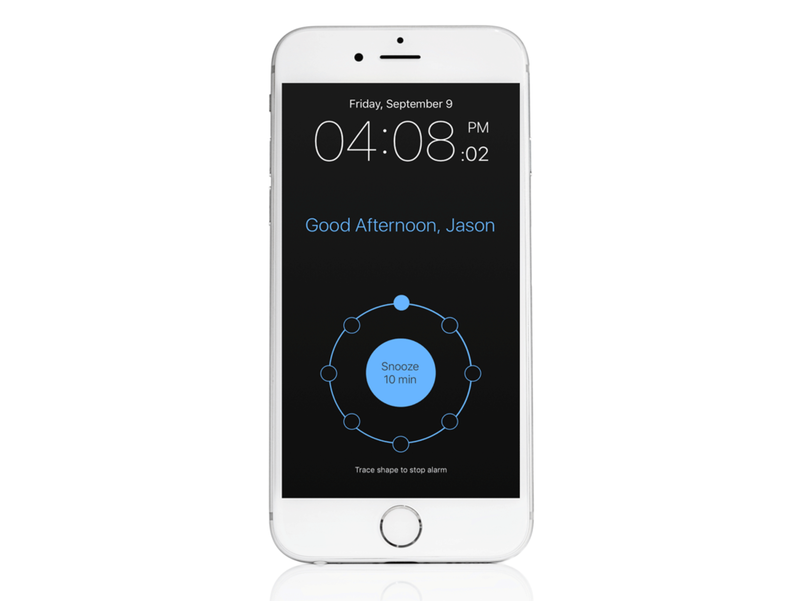 Being the first and last points of interaction in a day gave Cleu a unique advantage in being able to provide additional value, especially in conjunction with connected devices like lighting and thermostats. This is the process flow for a first-time user of Cleu. Once connection to a connected device is established, the IoT Devices Log-in path only gets used when new device functionality comes online or the users terminates a connection. At a glance, the architecture of Cleu may appear simplistic. At least that's what I was going for. But inside, I was focused on creating a structure that was not only solid and seamless for our first device integration, but scalable for our next ten, twenty or beyond. Many of my Cleu sketches were focused on working through navigation structure and taxonomy issues. 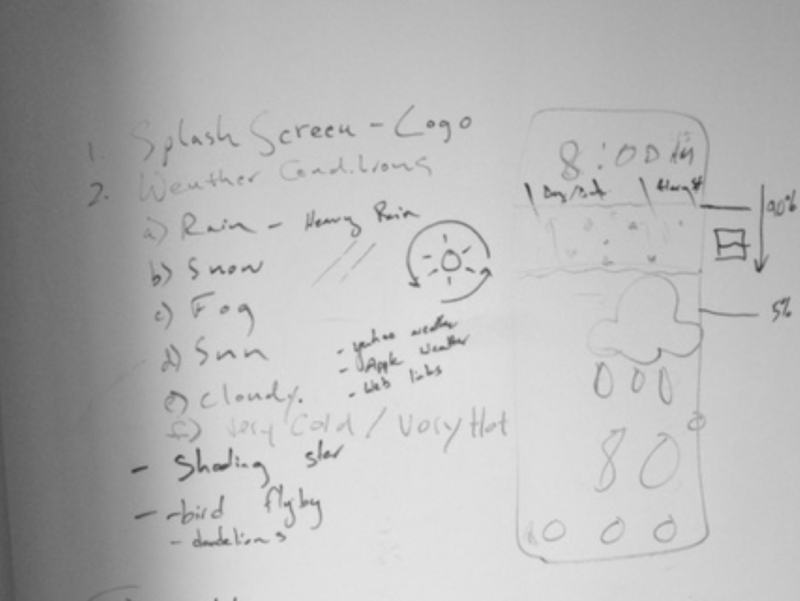 Occasionally I would try my hand at designing various weather conditions. The wireframes I provided the dev team acted as a guide pointing in the direction the application was moving. Because we were all working together around the table, conversation and collaboration was the key ingredient. As we approached the prototyping phase, I mapped out all the screens in the experience so the team could get an at-a-glance impression of the user journey and easily reference any sticking points. Cleu 3.0 was meant to feel simple, sleek and subtle. Yet at it's core, facilitate complex environmental interactions. We were going for a Tron meets Jetsons feel. 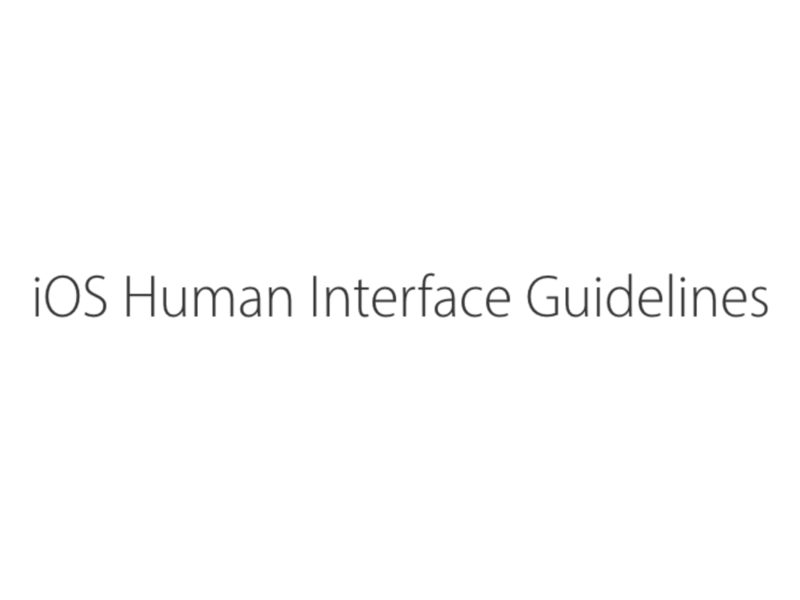 As for the guiding principles of usability, I stuck closely to the examples set forth in the iOS Human Interface Guidelines. Prototype screens for Cleu were built in OmniGraffle and stitched together in InVision. I kept with a mid fidelity look knowing that we would be making changes and testing various components during the week of usability testing. The façade and interactions were real enough to capture reactions. We fortunately had the ability to test for a week as the dev team began foundational work. I ran a series of sessions on Monday, Wednesday and Friday. During the in-between days, the team went over the notes and made adjustments if we saw fit. By the end of the week we had conducted 13 iterative sessions and felt comfortable moving forward with the design. The team hit our deadline and launched the iOS version of Cleu 3.o on April 30, 2015. It was a tense week as the app sat in review, but we were overjoyed when the approval came through. We had successfully built an advanced alarm experience enabling users to control their environment. Unfortunately, our move into the wearable vertical wasn't as smooth as the IoT journey. Is there a market desire for a slimmed down version of Cleu on a watch? Most importantly...what the heck is an Apple Watch and how are we supposed to design and test for the platform? Just as with the iOS application (and running concurrently with it's design), I set out to utilize a user-centered design approach for the Watch OS version of Cleu. Because the Apple Watch hadn't been introduced to the market yet, the process posed unique challenges along the way. In reviewing Mixpanel analytics data, we saw heavy usage of the PowerNap feature by Cleu users. It made sense to explore that as a light-weight extension of the product. Just one question...how long do people nap? What's the average? We reviewed sleep journal articles as well as conducted card sorts to determine the values. Because the Watch had yet to be released, we weren't exactly sure who the competition would be. Rumors would trickle in of certain apps making a run at the platform, but nothing felt solid. What we were certain of, through the interviews we had conducted, was that our target persona was using the native Clock application on the phone for naps. Also through our interviews, in seeking validation of our nap assumptions, our persona was using his phone timer for productivity sessions at the whiteboard and often at the gym in the evenings. Our intention was to increase the Cleu touchpoint by one during the day, but it seemed like there was potential for a few more. As we became more familiar with the Watch documentation, the interaction patterns came into focus. This was the first Apple product to use a "deep touch" gesture which would later be renamed 3D Touch. After studying the guidelines, we stuck with our plan of simplicity. The Cleu Watch extension didn't set out to change the world. We weren't even certain what was possible. But we stayed focused on our plan of a PowerNap timer as the entry onto a brand new platform. After completing the build it was time to test the app. But how? Nobody had a watch. I read articles about teams experimenting with analog watches to test certain elements of the experience, but there was no way of testing the application in the context for which it was designed. We ran tests on Xcode and hoped for the best. The April 30 deadline had unfortunately come and gone. Version 3.0 of Cleu had successfully launched, but without it's Watch extension. The build bundle would go in, and the news back from review would be disappointing. Eventually we pulled the extension from the app so as not to cost the iOS anymore time. On June 24, 2015, version 3.1 of Cleu launched with it's Watch extension. It was a glorious relief. Despite the slight delay in launching Cleu 3.0 as a unified iOS/Watch system, the feedback coming in from users new and old was overwhelmingly positive. Just as Cleu hit the store, Uzair Hussain (Cleu Founder) was invited to speak at Kluge Interactive's Evenings at the Loft session entitled "Wearables And Design". We were honored to present the story at such an amazing event and felt it tied a poetic bow around the whole journey. For the team at Cleu, the 3.0 honeymoon didn't last long. Of course we took a couple days to celebrate, but it was soon back to work. Aside from the occasion bug that sprung up, the team began focusing on adoption rates and conversion metrics, monetization plans and partnerships, future connected device expansion, and refining the customer journey experience by addressing standout moments of truth. Cleu is an advanced connectivity application led by an automation visionary. The sky's the limit on how it will develop and change the daily interactions of it's customers. I consider myself lucky to have worked with this amazing team and helped build an exciting product.